In half a century of existence, The Who have had a consistent presence in cinema. Aside from their theatrical projects Tommy (1975) and Quadrophenia (1979), their history has also been chronicled in documentaries such as The Kids Are Alright (1979) and Amazing Journey (2007). This new documentary looks at the men behind the band, Kit Lambert and Chris Stamp. Aspiring filmmakers who initially saw managing a rock band as a back door into the film business, the film follows their and the band’s journey to stardom, and the many implosions along the way. The story of two young men who, in some ways inadvertently, built rock history as they went along, is both charming and fascinating. Stamp is seen as the energetic working class character who compliments the polished, upper class authenticity of Lambert. While their path, somewhat inevitably, ends sadly, it’s difficult not to marvel at the simple genius of recognising what they had. Seeing Pete Townsend as their musical ‘golden goose’, doing all they can to cultivate his talents; acknowledging that the appeal of a band stemmed not just from the music but the look and even the faces in the audience. In an age of creatively told docs, the linear pattern of the narrative does lead to some slower moments but, however conventional, everything comes across as more human rather than a detached document of history. Contributions from people such as Stamp’s movie star brother Terence (talking from a family perspective rather than that of a ‘showbiz anecdote’) and Mod celebrity Irish Jack create the effect. Through this dynamic we view the band themselves. An astonishing visual archive unfolds, which seems to chart from their very beginnings to present day, while Townsend and Daltrey slowly unravel the often fraught relationships with their fellow members. Daltrey is portrayed as the brash front man (described as a ‘Street Fighter’), agitated by Townsend’s position in the band, although thoroughly aware that their managers were taking them in a successful direction. Townsend himself is shown as equally volatile in parts, but coached by Lambert into carving the band’s musical destiny. The stories of band discord, Tommy and Keith Moon’s antics are nothing that any music fan wouldn’t have already known or imagined, however hearing the pair talk it through themselves gives the film a more personal feeling. 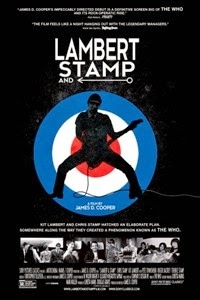 Lambert & Stamp is fascinating rock ‘n’ roll tale told stylishly, as befits such subject matter. However straightforward the narrative, the exciting sounds and images of the time animate the journey of two young men searching for their dream and finding it. Absolutely essential viewing for aficionados of the band, and a captivating couple of hours for everyone else.